Branwells’ Mill was the locals’ name for Vellanhoggan Mill, which had stood and worked for generations before, set alongside the Ponsandane Brook; somewhere around 1870 the mill was expanded and developed [see the notice below], and again in 1884 with new grand buildings, in much the same style as the Granaries and Offices in Penzance, which were set by the Railway Station. 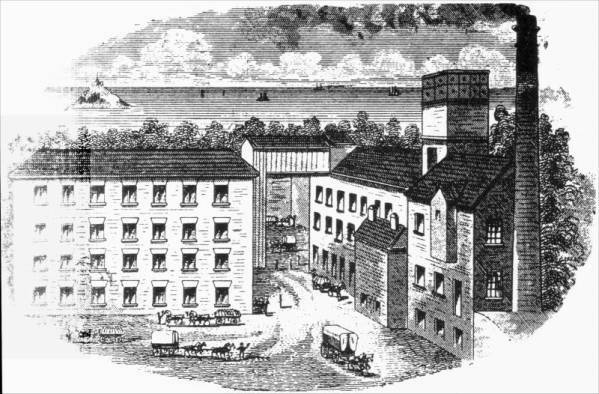 At that time the mill was named The Penzance Steam Flour Mills, of some considerable height and mass, made the larger by the fact of the water tower and high brick chimney. There had previously been a great fire in 1865, and so when the new building was formed, they were taking no chances. At the mills were kept their own 24 horses, all well stabled, and wagon houses and a wheelwrights workshop, it was the wheels that needed constant repair as well as new ones; necessary, as the mill produced over 1,000 sacks of milled corn per month. Being set on the side of the brook, the mill was also fitted with a 50 horse power waterwheel. The three steam engines gave 210 horse power. Unfortunately, larger and more efficient mills were being built on the great ports (milling straight from the ship, instead of transporting to the mills) and so milling in Penzance died off; The mill at Vellanhoggan closed in 1902, with the loss of 30 men’s livelihoods. 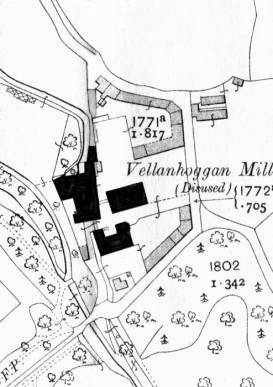 The mill is shown on the 1908 Ordnance map as diused, by 1936, the mill buildings had been totally demolished. The only legacy we have is the great Granary in Penzance, which unfortunately has been named as Branwell’s Mill, for no mill existed on that site. 1st November 1871; Notice was given by John Richard Branwell and Robert Matthews all of Penzance and of Vellanhoggan Mills in Gulval, trading as R M. Branwell & sons, flour merchants and millers, lessees and tenants of tenement of Vellanhoggan, to the Penzance Board of Highways and Mr Thomas Care, surveyor of the board, of their wish to stop-up and divert the public footway and road running through their mills. Mills: The Penzance Steam Flour Mills, Gulval. Telegraphic Address: "The Branwells, Penzance". Messrs R M Branwell and Sons trade on a large scale as millers and general merchants, having an extensive connection of an exclusively wholesale character. The business has descended from father to son during many generations, the headquarters being the large block of three and four storey buildings near the Great Western Station, known as "The Granaries". The buildings are of granite and familiar to all residents of Penzance and to many of the occasional visitors. Behind the granaries are commodious and well appointed offices, which have been built within the last ten years. The milling operations are carried on at the Penzance Steam Flour Mills, at Gulval, about a mile to the east of Penzance. The mills have been altered and re-arranged from time to time, and are well built and well planned structures. They comprise a group of buildings of varying heights, the principle ones being of three and four storeys, while extending to a greater altitude is a square water tower, and adjoining it is a tall chimney stack and engine boiler houses. From the tower a splendid view of the sea and the surrounding countryside can be obtained. The milling plant is of modern construction, on the roller system which has for some years almost superseded the older millstones, with the best technical, practical and commercial results to the milling interest, and to consumers of flour. With a good plant of roller mills, supplemented by an adequate complement of purifying and dressing machinery, the resources and capacities of modern flour mills are far in advance of the best millstone mills of twenty years ago or less. On 29th December 1812, Charlotte Branwell married (at Madron Church) Joseph Branwell of Gulval. Witnesses were Robert M Branwell, Richard Branwell, Elizabeth Branwell, Grace Thomas and Tobias Read. Charlotte was one of the seven children of Thomas Branwell and Ann (nee Carne), who were married at Madron 28th November 1768. On this same day, 29th December 1812, her sister Maria was getting married at St Oswald’s church to the Rev Patrick Bronte, the service being performed by his friend the Rev William Morgan. Shortly before that Reverend Patrick Bronte had performed the marriage ceremony for Rev William Morgan, marrying Jane Fennell, Maria’s cousin, for Jane’s father was the Reverend John Fennell [Wesleyan minister at Falmouth and Leeds, he was ordained into the Church of England in 1816; became Rector of Cross Stone near Todmorden 1819-1841. He had been the First Governor and head of Woodhouse Grove School Yorkshire in 1812; Patrick Bronte also was there in 1813; Jane Branwell was governess of Woodhouse Grove School 1812-1813, though some say she left a lady in her place and went off to meet her friends about]. And, there is the connection in which Penzance rejoices in the connection with the Bronte family. she died 31st March 1855.
iv) Patrick Bronte born 1817, engineer, stationmaster at Luddenfoot in 1838, he died 24th September 1848.
v) Emily Jane Bronte born 1818, wrote as Ellis Bell, died 19th December 1848.
vi) Anne Bronte born 1821, wrote as Acton Bell, died 28th May 1849. This and below compiled from Cornish Sources, in particular G C Boase. Joseph Branwell, builder, who married Temperance Matthews 2nd March 1772 at Madron. Joseph Branwell was the son of Richard Branwell, a builder of some repute in with his partner Edward Hamilton, the builders of the Assembly Rooms of the Union Hotel (note below) in 1791 and 25 Chapel Street and others. Richard Branwell was born 1711 (father Martyn Branwell) and married to Margaret John. [whether or not she was connected with George John of Rosemorran reamains to be seen]. a) Robert Matthews Branwell (Snr), flour merchant and grocer, married Jane Richards of Newlyn. Son, John Richards became a senior partner in RM Branwell & Sons, corn merchants, became mayor of Penzance in 1865, 1868 and 1871. He built Penlee House in 1865 … See The Lion of Penlee page (link above). i) Robert Branwell, grocer and flour merchant; married Jane Richards of Newlyn, he became mayor of Penzance in 1850.
mayor of Penzance 1865, 1868, 1871. Married Miss Tyacke of Rotherhithe; 5 children. lived at Redinnick House, Penzance. they lived in Penare House. viii) Lavinia Branwell, married Francis J Cornish, grocer, Greenmarket. She was poisoned by her husband and died at Brighton 1st July 1866.
i) Thomas Bronte Branwell, Secretary’s Dept War Office until 1878.
ii) Charles Henry Branwell, Midshipman RN, died young. Note : The Union Hotel was formerly known as The Ship & Castle Hotel, and Penzance becoming a centre, from 1770, for meetings, assemblies and balls, it became obvious that some expansion was necessary. The Assembly Rooms were opened in 24th October 1791, and provided a chandeliered ballroom, together with a theatre over the stables, becoming the Georgian Theatre; it appears that the theatre was closed in 1839, but when I inspected the building some years ago c1975, as it was a disused Masonic Hall, there was a separate dressing room which contained many old playbills and posters, though some appeared to be later than 1839. I may look into that story later. The front of the Union Hotel was altered c1835. I will cover the Union Hotel on the Chapel Street pages whenever possible.